The Easy X-Trac is used to perform a minimally invasive tooth extraction on single and double rooted teeth. The system allows for immediate implantation after extraction, and eliminates all rotary/pulling movements, post traumatic swelling, and need for bone restoration. 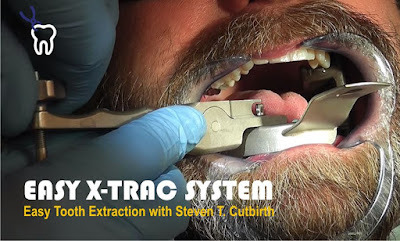 CLICK HERE NOW to find out how to take your practice to the highest level of technique and productivity by joining Dr. Cutbirth’s: www.DentistryMasterClasses.com.